Yeehaw! 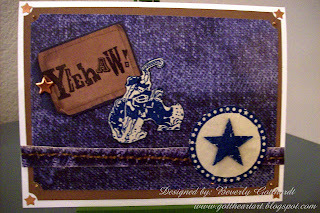 This one turned our pretty neat--Over at Rubbernecker Wacky Wednesday it is a Tag You're It, you can't see it real well because of my lighting issues(working on those, I've had some suggestions) but the Yeehaw is a tag. Also, I turned the sketch from card positioning systems . At CCEE Stampers, Charlene Merrick sent us over to Anna Wright's photo gallery for some inspiration, boy she can photograph, hop over to CCEE and catch the link over to Anna you won't be sorry. 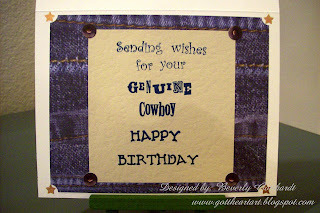 Supplies: Card Blank Ivory 61/2" X 5" Value Pack Hobby Lobby, brown and tan card stock from my scrap box, CTMH-X7054A Denim Days paper pack, Ink: Stampin Up-Not Quite Navy, CTMH marker-Outdoor Denim, Elmers copper leafing pen, Stamps: CTMH-C1280 Out West,B1305 Yeehaw, C1306 Genuine Country, Sweet and Sassy word stamps, Will 'n Way WWST-4815 You Choose Words, small dot stickers, Mrs. Grossman's-small star stickers, Stampin Up-ticket punch, pop dots. Super job, so glad you played along. I love your western theme. Very nice Beverly, thanks for playing along! This is absolutely ADORABLE and I LOVE it! You need to go back and make sure you have a link in the comment on the Rubbernecker Blog. It wasn't there and I had to hunt the card down - you REALLY want to link this one!